(C) 2013 Juan Francisco Araya. This is an open access article distributed under the terms of the Creative Commons Attribution License 3.0 (CC-BY), which permits unrestricted use, distribution, and reproduction in any medium, provided the original author and source are credited. For reference, use of the paginated PDF or printed version of this article is recommended. A new species of the genus Aeneator Finlay, 1926 is described from off the coast of Caldera (27°S), northern Chile. Aeneator martae sp. n. has a small, broad, stout, angulated shell with more prominent axial ribs and a more obviously keeled periphery than all previously named Chilean species. Comparisons are provided with all other South American named species of Aeneator. The genus Aeneator Finlay, 1926 comprises a group of deep-water gastropods of moderate size, distributed in the South Pacific Ocean around New Zealand (Powell 1979, Beu 1979) and Chile (Rehder 1971, McLean and Andrade 1982, Fraussen and Sellanes 2008). Almost all the species have offshore distributions, and they are common on the sea floor (Dawson 1965, Powell 1979, Beu and Maxwell 1990). Their elongate fusiform shells have rounded whorls with a subsutural concavity, a lip with a broad shallow sinus below the suture, and a sculpture of strong axial ribs overridden by spiral cords (McLean and Andrade 1982). In the southeastern Pacific the genus encompasses five extant species: Aeneator castillai McLean & Andrade, 1982, Aeneator fontainei (d’Orbigny, 1839), Aeneator (Ellicea) loisae Rehder, 1971, Aeneator portentosus Fraussen & Sellanes, 2008 and Aeneator prognaviter Fraussen & Sellanes, 2008. The distribution of these species ranges from Bahía Independencia (14°S), in the south of Peru to Canal Moraleda 45°22'S, southern Chile (Osorio et al. 2006). Their bathymetric range is from 10 m depth for Aeneator fontainei collected at Mejillones Bay, in the north of Chile (Guzmán et al. 1998, Laudien et al. 2007) to 800 m depth for Aeneator portentosus, collected off Iquique (Fraussen and Sellanes 2008). Most of the species have been recovered in the trawls of the local shrimp industry (McLean and Andrade 1982, Rehder 1971, Párraga 2012, Queirolo et al. 2011), and very little is known of their population biology, ecology and conservation status. 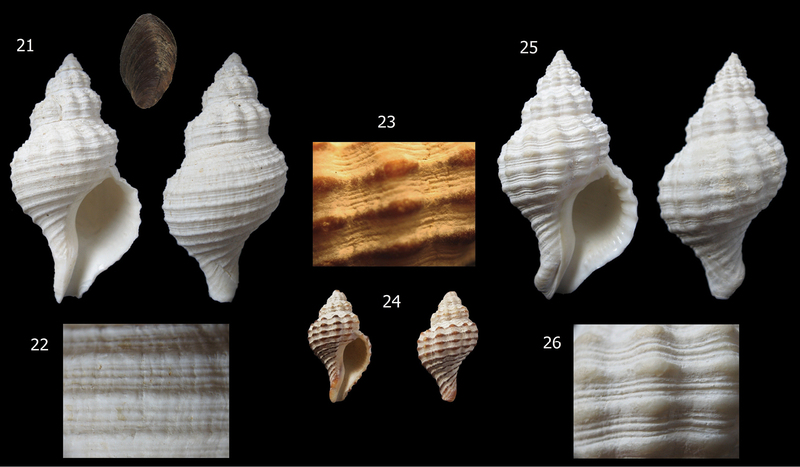 The present work describes a new species of Aeneator from northern Chile based on shell morphological features. Criteria were shell shape, number of primary spiral cords, development of secondary spirals, and axial sculpture. An identification key, based on shell characters, is given for all the extant Chilean Aeneator species. Material examined: Aeneator martae sp. n. types, Chile, Region of Atacama, Caldera, holotype MZUC 37890, paratype 1 MZUC 37891, paratype 2 MZUC 37892, paratype 3 MG 200105. Examination was made of shell only specimens; all measurements were made with vernier callipers (± 0.1 mm). For the measure of length of aperture and angle of the spire, the methodology of Dépraz et al. (2009) and Chiu et al. (2002) was used. Abbreviations: KF; Private collection of Mr Koen Fraussen, Aarschot, Belgium, MG: private collection of the author, section marine Gastropoda, MZUC; Museo de Zoología de la Universidad de Concepción, Concepción, Chile, RC Coll; private collection of Mr Ricardo Catalán, Servicio Nacional de Pesca, Chile. Type species. Verconella marshalli Murdoch 1924 (by original designation), Pleistocene and recent, New Zealand. Holotype (MZUC 37890), 47.9 mm. Chile, off Caldera (27°04'S, 70°50'W), 550–600 m depth, live collected on shrimp trawl nets, January 2001, S. Castillo leg. Paratype 1 (MZUC 37891), length 44.0 mm. Paratype 2 (MZUC 37892), 41.7 mm, Paratype 3 (MG 200105), length 40.2 mm. All the paratypes with same locality as the holotype. Known only from the type locality; Chile, Region de Atacama, Caldera (27°04'S, 70°50'W), 550–600 m depth. A small species of Aeneator, height up to 47.9 mm, shell stout, inside of aperture pale orange, exterior sculptured by well-defined axial ribs, spiral cords, and a conspicuous stepped shoulder. Shell small for genus (height up to 47.9 mm, Table 1), thick, solid, fusiform, chalky white to pale brownish, inside of aperture pale orange. Shape broad, angulate, length of aperture and canal more than half length of shell, width/height ratio 0.53 to 0.56, whorls convex apart from slightly concave sutural ramp, suture shallow but impressed. Spire angle 63° to 68°. Protoconch and upper teleoconch whorls missing, remaining whorls about 4.5, last 3 with sculpture intact with 7–9 primary spiral cords, interspaces each occupied by one narrow, well defined secondary cord. Last whorl with 16–18 spiral cords, more prominent at periphery of shell than elsewhere, forming a distinct keel. Spire whorls with 24–28 pronounced axial ribs, interspaces deep, each almost equal to a rib in width. Last whorl with 14–15 such ribs. Ribs more pronounced towards the anterior end of shell. Aperture ovate. Parietal and columellar area well-defined, glazed; outer lip thin, slightly crenulated, without lirae or teeth. Siphonal canal short, open, directed slightly to left. Operculum large, thin, dark brown, elongate, nucleus terminal, tip sharp. Aeneator martae sp. n. measurements of specimens. (%) means percentage compared to the total length of the shell. Aeneator martae sp. n. shell, Holotype 47.9 mm, Chile, Off Caldera, 27°04'S, 70°50'W. 550–600 m. MZUC 37890. Aeneator martae sp. n. shells. 6–8 Paratype 1 (MZUC 37891), 44.0 mm height 9–11 Paratype 2 (MZUC 37892), 41.7 mm height 12–14 Paratype 3 (MG 200105), 40.2 mm height. Details of shell sculpture of ChileanAeneator species. 15 Aeneator castillai (RC Coll. ), 85.7 mm 16 Aeneator fontainei (RC Coll. ), 48.0 mm 17 Aeneator loisae (MG 200003), 78 mm 18 Aeneator martae sp. n. paraype 3 (MG 200105), 40.2 mm 19 Aeneator portentosus, Paratype KF-0338, 45.5 mm 20 Aeneator prognaviter (MG 200124), 33, 0 mm. Named in honour of Mrs Marta Araya, Caldera, Chile, who presented the specimens to the author. In Chile the genus Aeneator encompasses five extant species: Aeneator castillai, found from Coquimbo (29°55'S) to Punta Peñablanca (33°22'S) in 200–450 m (McLean and Andrade 1982), Aeneator fontainei, the most common species, with records from Bahía Independencia (14°S) in the south of Peru (McLean and Andrade 1982) to Estero Elefantes, 46°05'S (Osorio et al. 2006) and with a bathymetric range of 10 m near Mejillones (Guzmán et al. 1998, Laudien et al. 2007) to 421 m for a specimen collected off Coquimbo (Figs 27–30), Aeneator (Ellicea) loisae, distributed from Caldera (27°04'S), for material examined in this work (Figs 27–30), to Canal Moraleda (45°22'S), in the fjords area (Osorio et al. 2006) with a bathymetric range of 200 m (McLean & Andrade 1982) to 465 m, Aeneator portentosus reported only form the original locality off Iquique (21°19'S) in 605 m and off Coquimbo at 800 m and Aeneator prognaviter, distributed off Antofagasta (22°51'S) in 318 m (Fraussen and Sellanes 2008) and in 748 m off Iquique for material examined in this work (Fig. 37). Data on the localities of Chilean species of Aeneator is provided in Table 3. Synthesis of characters of the Chilean species of Aeneator Finlay, 1926 based on Rehder (1971), McLean and Andrade (1982), Fraussen and Sellanes (2008) and material examined in this work. Table of localities of Chilean species of Aeneator Finlay, 1926 based on Rehder (1971), McLean and Andrade (1982), Fraussen and Sellanes (2008), and material examined in this work. 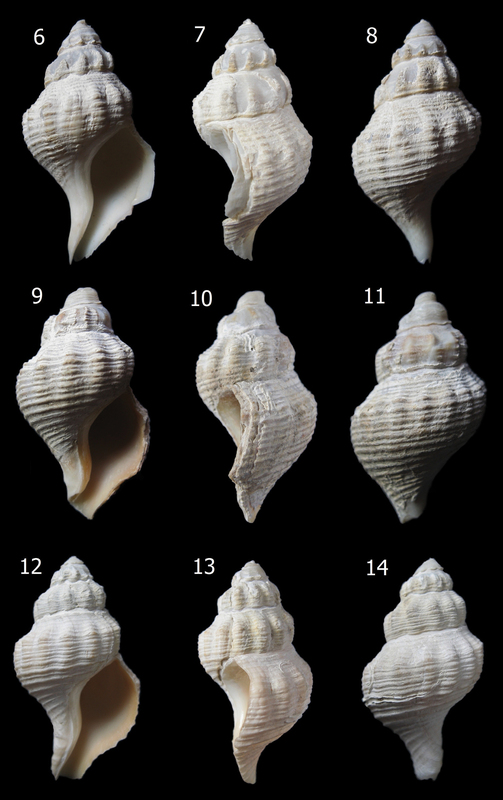 Aeneator fontainei varieties and details of shell sculpture. 21–22 Off Coquimbo, Chile, trawled 421 m (RC Coll), 58 mm 23–24 Washed ashore, Calderilla beach, Caldera, Chile (MG 200011), 28.5 mm 25–26 Dredged 20 m depth off Loreto beach, Caldera, Chile (MG 200012), 52.8 mm. In size, the shell of Aeneator martae sp. n. is similar to Aeneator prognaviter (Figs 20, 37, 38) and Aeneator portentosus (Figs 35, 36). However, the former of these two can be clearly differentiated from the new species by its wider and shorter siphonal canal, less numerous and more curved axial ribs and a thinner, snow white shell (Fraussen and Sellanes 2008). From Aeneator portentosus the new species differs by having a much wider, thicker shell with a shorter spire, a more elongate aperture, dominant axial sculpture and less rounded whorls. Moreover Aeneator portentosus exhibit a very distinctively sculptured periostracum (Fig. 19), with low axial ridges, very different from all the other Chilean Aeneator species. A periostracum is absent in the examined specimens of Aeneator martae sp. 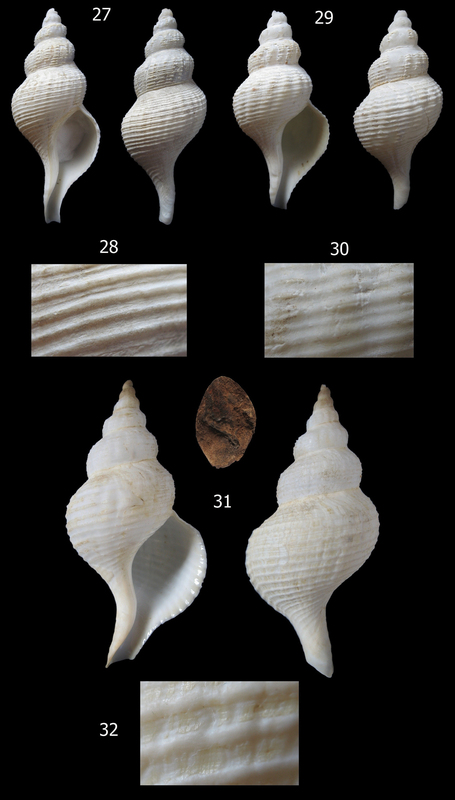 n.
Aeneator species and details of shell sculpture. 33–34 Aeneator castillai, off Coquimbo, Chile, 380 m depth (RC Coll. ), 85.7 mm 35–36 Aeneator portentosus, Paratype KF-0338, 45.5 mm 37–38 Aeneator prognaviter, off Iquique, Chile, 748 m depth (MG 200124), 33, 0 mm. 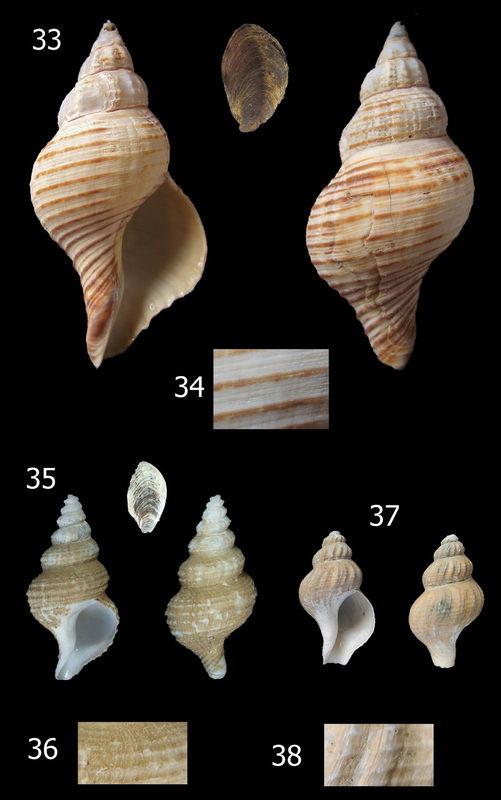 Aeneator castillai (Figs 33, 34), and Aeneator fontainei (Figs 21–26) differ markedly from the new species by their much larger shells, reaching up to 85.8 mm, more fusiform shells, with a much less stepped or indistinct shoulder, lower and fewer axial ribs, brown primary spiral cords (Figs 15, 16) and lip lirated within. The spiral sculpture is quite different; Aeneator fontainei has 13 to 16 dark brown major cords, with interspaces filled with five secondary cords separated by fine grooves or by secondary and tertiary cords. Aeneator castillai has brown primary cords with 3 to 5 fine secondary cords filling the interspaces and exhibits a longer, twisted, siphonal canal. In contrast Aeneator martae sp. n. lacks any brown coloration, shows a sculpture of alternated single major and minor spiral cords defined mostly in the posterior part of the whorls, and has a conspicuous stepped shoulder, forming a keel at the periphery. Aeneator loisae (Figs 27–32) differs from the new species in having a larger, up to 104 mm, white to snow white shell (different from the white to light brown shell of Aeneator martae sp. n.), more inflated last whorl, with a much longer siphonal canal, a higher number of primary and secondary spiral cords, more prominent spiral sculpture, and fewer, more tenuous, axial ribs. The new species is tentatively assigned, given the generic uncertainties within the Chilean species, to the genus Aeneator Finlay 1926, typified by the species Aeneator marshalli marshalli (Murdoch, 1924) recorded from Castlecliff (as fossils) and, as a recent species (= Aeneator marshalli separabilis Dell, 1956), from Wanganui and Ohope beach, Whakatane, New Zealand. Similar to the type species, Aeneator martae sp. n. has a fusiform shell with moderately tall spire, shallow sinus in outer lip and a spiral sculpture of cords crossed by axial costae (Beu and Maxwell 1990). The new species differs from Aeneator marshalli in its smaller shell, shorter anterior canal, the absence of nodules along the columellar lip, less inflated whorls and by the presence of a distinct keel at the periphery. From the genus Austrofusus Kobelt, 1879, with the type species Austrofusus glans (Röding, 1798), the new species differs in the smaller size, its thicker shell, more prominent sculpture, the more prominent ridges over the periphery, and the pale orange colour of the aperture, which is white in Aeneator glans (Beu & Marshall 2010). Comparative characters in the Chilean species of Aeneator are compared in table 2. In a recent revision of the fossil fauna of Mejillones, north of Chile (Nielsen 2012), the species Aeneator loisae was synonymized with the fossil species Fusus steinmanni Möricke, 1896 into Austrofusus. However, this was based partly on the incorrect conclusion by Beu and Marshall (2010) that Aeneator fontainei is the type species of Austrofusus; this was later corrected by Beu and Marshall (2011). On morphological grounds, the author concurs with McLean and Andrade (1982) and considers that Aeneator (Ellicea) loisae does belong to the genus Aeneator and the sub-genus Ellicea Finlay in Marwick, 1928. However the generic placement of the species Aeneator fontainei, Aeneator castillai, and possibly the new species described here, should be further investigated or even be ascribed to a new genus. Further study of radular characters, comparative anatomy and DNA will improve the taxonomic placement of the Chilean species. Fossil studies would also give a general insight into the development of the genus and their relationships with the South Pacific related fauna, especially those from New Zealand and adjacent waters. Aeneator castillai, Chile, Region of Coquimbo, Coquimbo, 2 specimens RC Coll. Aeneator fontainei, Chile, Region of Atacama, Caldera, 3 specimens MG 200011–200013, 5 specimens RC Coll. Aeneator loisae, Chile, Region of Atacama, Chile, 4 specimens MG 200003–200006, 1 specimen RC Coll, Aeneator prognaviter, 2 specimens MG 200124–200125, Aeneator portentosus, 1 specimen (examined from images), KF-0338. – Shell with a distinct keel, aperture almost subquadrate Aeneator martae sp. n.
The author wishes to thank Mrs Sandra Castillo for collecting the specimens in situ, Mr Koen Fraussen (Aarschot, Belgium) for sending bibliography and images of the paratype of Aeneator portentosus, commenting about the genus, and reviewing the manuscript. I am grateful to Dr. Guillermo Guzmán (Museo del Mar, Universidad Arturo Prat, Chile) for helping with the specimens of Aeneator prognaviter, Sergio Miquel (Museo Argentino de Ciencias Naturales Bernardino Rivadavia, Buenos Aires, Argentina) for his comments on the early manuscript, Dr. Sven Nielsen (Institut für Geowissenschaften, Christian-Albrechts-Universität zu Kiel, Kiel, Germany) for sending useful bibliography, Mr Ricardo Catalán (Servicio Nacional de Pesca, Chile) for loaning Aeneator specimens for examination from his personal collection, Dr. Alan G. Beu (GNS Science, Lower Hutt, New Zealand) for his comments on the genus, help with essential bibliography, and for his comments and correction of the manuscript. Finally, I would like to thank the reviewers and the associate editor for their very helpful suggestions on the manuscript and the Encyclopedia of Life (EOL) Open Access Support Project (EOASP) for supporting the open access of this paper. Beu AG, Marshall BA (2010) Austrofusus Kobelt, 1879 replaced by Aethocola Iredale, 1915 in New Zealand (Mollusca: Gastropoda: Buccinulidae). Molluscan Research 30: 53-55. Beu AG, Marshall BA (2011) Retraction: Austrofusus glans (Röding, 1798) is the type species of Austrofusus Kobelt, 1879 (Gastropoda: Buccinulidae). Molluscan Research 31: 61-62. 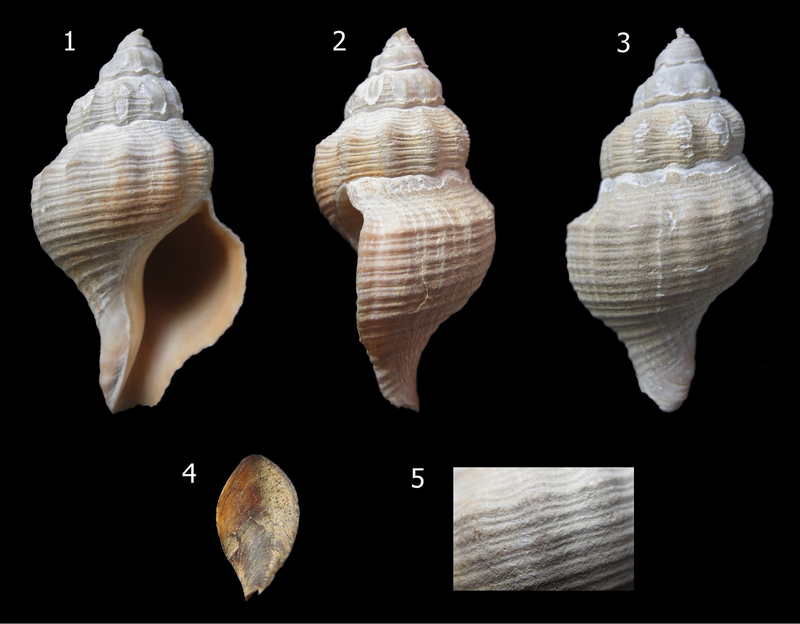 Fraussen K, Sellanes J (2008) Three new buccinid species (Gastropoda: Neogastropoda) From Chilean deep-water, including one from a methane seep. Veliger 50 (2): 97-106. McLean JH, Andrade H (1982) Large archibenthal gastropods of central Chile: collections from an expedition of the R/V Anton Bruun and the Chilean shrimp fishery. Contributions in Science 342: 1-20. Osorio C, Peña R, Ramajo L, Garcelon N (2006) Malacofauna bentónica de los canales oceánicos del sur de Chile (43°–45°S). Ciencia y Tecnología del Mar 29 (1): 103-114. Rehder HA (1971) A molluscan faunule from 200 meters off Valparaiso, Chile, with descriptions of four new species. Proceedings of the Biological Society of Washington 83 (51): 585-596.